Obsessed with being an A+ in a world of D-? Check out WonderWink’s Best in Class line- WonderFLEX. Favored for the stretch poly-cotton blend providing a not-too- tight, flattering fit you can choose from five tops and two pants for women or a top and pant set for men. The design details make WonderWink’s WonderFLEX line stand out from the crowd with triple stitched contrasting colors and the same functional loops and pockets you’ve come to love. WonderWink WonderFLEX: A Fan Favorite Amongst Scrubs for Women and Men! Ready for a fit that's a step above the rest? WonderWink's WonderFLEX is an all-around favorite with nurses and medical professionals because of its flattering fit and flexible wear. Not too snug but with just the right amount of give, you can count on quality scrub tops and pants with the WonderFLEX collection. And there's even a scrub jacket and lab coat to choose from, too! With plenty of color and cut options, you'll find exactly what you're looking for in this stunning and comfortable scrub collection. Let WonderWink Scrub Shop outfit your scrub wardrobe with these fabulous features, with tops starting at $19.98 and pants starting at $21.98. Function and affordability are here! The WonderFLEX line of fashion scrub wear begins with the flexible and versatile 52% Cotton/45% Polyester/3% Spandex construction which provides comfort, strength and flexibility for every shift, every time. Triple-needle, contrasting color stitching adds durability and a touch of fancy without being overwhelming. 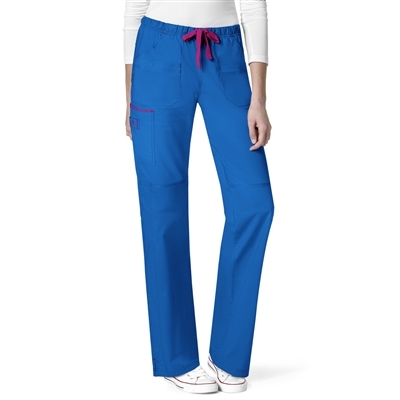 Side vents in the scrub tops provide ease of movement for both men and women. You'll also find lots of pockets in all the right places and functional loops to help you keep track of everything you need for each shift. With trending and calming names like "Verity," "Patience", and "Anchor", you'll be ready to tackle every shift with a professional state of mind that gets things done! All women's tops and pants are available in sizes from XXS-3XL, with the Verity and Patience scrub top styles and the Faith and Grace scrub pants styles ranging up to 5XL. Men's sizes range from XS-3XL. Plus, WonderFLEX now includes a modern cut, white lab coat and a snap-front jacket in multiple colors finely crafted in the same flexible fabric for women in sizes from XS-3X. Check out the full variety of styles you'll find in this wonderful collection. Verity V-Neck Top: Darted V-neck tops with front pockets and pocket-in-pockets; available in 34 colors. Charity Fashion Y-Neck Top: Angular and modern neckline combined with princess seams for a flattering fit; available in 20 color options. Patience Curved Notch Neck Top: Branded front yoke with neck facing that overlaps at the center; available in 26 fashion colors. Trinity Color Block Top: Seven combinations of trim colors in this tri-color scrub top to add sparkle and flair for your all-around style. Peace Contrast V-Neck Top: Tossed pockets and two front darts give this classic style an updated fit; available in five distinguished colors. Grace Flare Leg Pant: Two front pockets, a cargo and a back pocket keep all your things within reach; available in 32 trending color combos. Faith Multi-Pocket Cargo Pant: The most storage space, with six pockets featuring hook-and-loop closures and bungee loops to give you extra places to clip your accessories; available in 28 adorable colors. Joy Denim Style Straight Leg Pant: Two tossed pockets, a WonderWink signature triple pocket and a webbed drawstring waistband; available in five great colors. Sky Tapered Leg Pant: A very stylish tapered-leg scrub pant that pairs perfectly with your scrub tops and features a slimming flat front with functional fly; available in six complimentary colors. Constance Snap-Front Jacket: Rib-knit cuffs and a curved neckline complete the look on this snap-front scrub jacket; available in 15 colors. Utopia Fashion Lab Coat: Featuring a hidden shoulder loop, a chest pocket, two front pockets and an adjustable belt. Honor Utility Top: A chest pocket, pen pocket on the sleeve and a cell pocket with media port complete this winning style; available in 14 colors with contrasting trim. Anchor Utility Top: Two invisible top-loading pockets and a double chest pocket with pen slot keeps this style tidy; available in eight colors. Anchor Color Block Top: Contrast raglan sleeves available in six color combinations give men a trending choice in comfortable fashion scrub tops with all the same features of the solid Anchor top. You'll always be loyal to WonderWink after trying the Men's Loyal Utility Pant! A straight-leg style with functional zipper fly, seven pockets and an extended utility loop to clip your badge or keys make this men's scrub pant a winner. It's available in 14 colors to mix or match with all of the great WonderFLEX scrub top choices for men. For even more quality scrub choices, check out the wide variety of other collections from WonderWink Scrub Shop like the Four-Stretch or the WonderWink 7-FLEX. And don't forget to join the WonderWink Scrub Shop rewards program to earn points on every purchase. The points will help you save money and fill up your scrub closet even faster with quality scrubs from WonderWink Scrub Shop! Expect compliments!